Many Freemasons nationwide have been of great service to the Boy Scouts of America by supporting the development of Scouting units, serving as volunteers, and assisting their Masonic lodges in forming and sponsoring Scout units. The relationship between individual Masons and Scouting, which has existed since the founding of Scouting in America, has resulted in immeasurable benefits for both Freemasonry and Scouting. At the June 2001 Quarterly Communication of the Grand Lodge of Pennsylvania, the Grand Master approved the creation of the Daniel Carter Beard Masonic Scouter Award. It was created with the approval of the Boy Scouts of America as a national Masonic Scouter award, and will be administered by the Grand Lodge of Pennsylvania as a service to all other Grand Lodges. The Daniel Carter Beard Masonic Scouter Award is an honor due to the countless Freemasons who practice the ideals of Freemasonry and act as role models to the young men who are part of one of our nation’s most outstanding youth organizations. The Daniel Carter Beard Masonic Award not only supports the Masonic relationship through the man who brought Scouting to America, but proclaims the integrity of the Freemason who is honored by receiving the award. Freemasonry’s relationship with the Boy Scouts started with a Freemason named Daniel Carter Beard. Bro. Beard was made a Mason in Mariner’s Lodge No. 67, New York City, NY, and later affiliated with Cornucopia Lodge 563, Flushing, NY. In the late 1800’s he founded a male youth program called the “Society of the Sons of Daniel Boone.” By 1905, the program had become “The Boy Pioneers.” The man who would create the first “Boy Scouts,” and be known as its founder, was Lord Robert Baden-Powell of Great Britain. Lord Baden-Powell, who was not a Mason, read of Beard’s program and, based on his own military experience, developed what is known as the “Boy Scouts.” In 1910, the Boy Scout program came to America when Bro. Beard merged his organization into the “Boy Scouts of America” and became its first National Commissioner. Bro. 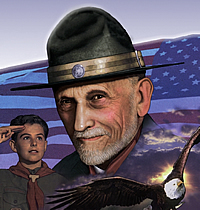 Beard, known affectionately as “Uncle Dan” by millions of Boy Scouts, worked tirelessly to create the Scouting Program that we know today. He developed the elements of the Scout badge and the Scout uniform, and wrote and illustrated various early publications of the Boy Scouts of America. Bro. Beard exemplified the Masonic ideals throughout the Scouting program. The Boy Scouts of America approved what is known as the “Community Organization Award Program,” which can be used by any community organization to honor its volunteers for Scouting. As part of that program, each organization is permitted to create its own neck medallion and to award a purple square knot badge with a gold border. The Daniel Carter Beard Masonic Scouter Award consists of a certificate endorsed by the recipient’s Grand Master, a Masonic neck medallion, and a Boy Scouts of America-approved knot patch to be worn with a Scout uniform. The neck medallion is a silver metallic medal of the square and compasses resting upon a sunburst and supported by a blue and silver ribbon. The knot patch is a gold colored square knot supported by a purple background with a gold border. All Master Masons in good standing are invited to recommend a contemporary for the award. Petitions for the award will be available through the Grand Secretary of each participating Grand Lodge. (Click here for a list of participating Grand Lodges.) Only the official petition may be submitted for this award. Brochures explaining the program are available for sale to Grand Lodge officials at our production cost of 25-cents each, and can be ordered by sending an e-mail to scoutaward@pagrandlodge.org. We will send an invoice with the shipment. The petition itself can be used on line, here, to type the required information, and then printed out to submit a petition through the proper protocol. Step One: The recommender must complete the petition and submit an attached page explaining the candidate’s qualification for the award. Step Two: The recommender should also have the petition approved and verified by the local Boy Scout Council that the candidate is currently registered as an active Scout leader. Step Three: The recommender should then have the application reviewed by the Worshipful Master of the candidate’s lodge. If found to be qualified, the petition will be authorized and forwarded to the lodge’s district deputy or other Masonic authority designated to handle the award in his home jurisdiction. That person will then submit the petition and check, as instructed by his Grand Lodge, for action. In Pennsylvania, the District Deputy Grand Master is authorized to sign PART IV of the petition, and will send it, the Statement of Accomplishments, and the check, to the PMYF Office, 1244 Bainbridge Road, Elizabethtown, PA 17022. Please Note: No Mason may submit himself for this award, nor should he seek it. It should be given because the Lodge recognizes that he is doing a Mason’s work by training and working with youth. The cost of the award kit is $35, which is borne by the candidate’s lodge. Checks (only Lodge checks are accepted) are to be made payable to the “Grand Lodge F. & A.M. of Pennsylvania” and submitted with the petition. Following appropriate Masonic protocol, they are submitted to the Grand Lodge of Pennsylvania through their home jurisdiction’s Grand Secretary for the recognition kit. The Grand Lodge of Pennsylvania will then forward the information on awardees to the Boy Scouts of America, Relationships Division, Irving, TX for the official record of recipients. The Daniel Carter Beard Scouter Award will be presented at the discretion of the Grand Master. It may be presented at a Grand Communication or similar meeting where a representative of the Grand Lodge makes the presentation. Arrangements also can be made to make the presentation at a Lodge or Scouting-related function. In all cases, a Grand Lodge representative should present the award. A sample presentation ceremony is available here. Should a recipient require more knots for his uniforms, or need to replace a lost medallion, he can do so by contacting the PMYF office at 800.266.8424 or pmyf@pagrandlodge.org and arranging an order of not more than 4 additional patches at a cost of $3.00 per patch. Checks can be made payable to the Grand Lodge of Pennsylvania. The National Association of Masonic Scouters was established to strengthen the relationship between Scouting and Freemasonry and to promote the awarding of the Daniel Carter Beard Masonic Scouter Award to worthy brethren. It is NOT a program or organization operated by the Pennsylvania Masonic Youth Foundation or the Grand Lodge of Pennsylvania, but it has received endorsement by the Right Worshipful Grand Master for the involvement of Pennsylvania Masons. Please visit http://www.nams-bsa.org/ for further information.